Ah, the Dollar Store. Every educator and homeschooling parent's dream store...so many great, cheap, items that can be used in so many ways! If you haven't already checked out my "20 Things to do with Candy Hearts" post yet, do yourself a favor and check it out. And as a note to educators who like to send home "home activities", there is a printable pdf at the end of the post for you to print and send home! Easy peasy! 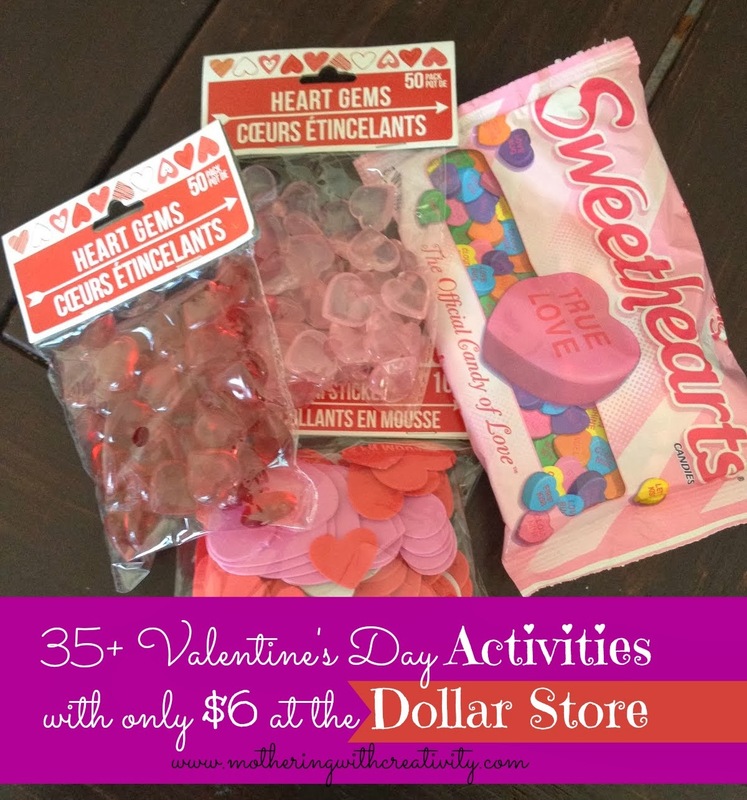 I made a quick trip to the Dollar Store last week to check out their Valentine's stuff. I bought a couple bags of candy hearts, a bag of red heart gems, a bag of pink heart gems, and a bag of heart stickers. Last year I got a bag full of heart shaped cookie cutters from the Dollar Store (not pictured). The good thing about having candy hearts in my house is that you can do so many things with them. The bad thing about having candy hearts in my house is that they're one of my favorite candies (read: I'm pretty sure I've eaten 2 bags by myself and it's not even Valentine's Day yet). I've seriously got to get some self control in that department. * Color Sort: These bags come with hearts in three different colors. Sort the reds from the pinks and whites. *Size Sort: My bag had three sizes of hearts. Sort big, medium, and small into different piles. *Heart Hunt: Hide a few of these hearts around the house. Who can find the most? *Size Patterns: Create a pattern according to size. (i.e. 'big, big, small, big, big, small' or 'small, medium, big' etc). *Color Patterns: Create a line of color patters (i.e. 'red, pink, red, pink'). *Heart Stack: Make stacks of hearts with a large one on the bottom, topped with a medium, topped with a small. *Number Piles: Put all the hearts in piles of 5 or 10. Practice skip counting with the piles (5, 10, 15...). Have older kids make a pile of 1, followed by a pile of 2, 3, 4, etc. *Sensory: Add a handful to a sensory tub filled with heart shaped items. *Color Patterns: Create various patterns. Little ones can do simple 'pink, red, pink, red' patterns, while older children can be more creative, like 'red, pink, pink, red, pink'. *Create a Shape: Make other shapes, such as circles and squares, using the gems. Older kids can do this on their own, while younger children may need to "trace" the outline of such shapes drawn on paper. *Sound: Place a handful of gems in a sock, pan, cup, etc. Shake! Do they sound different in different containers? *How Many? : How many heart gems will it take to fill up a small cup or container? *Distance: How many "hearts long" is a shoe, paper, pencil, etc? *Visual: Hold a gem up to your eye. Close the other. Can you see through it? Do things look different when looking through a gem? How? *Sensory: Add gems to a sensory tub filled with heart shaped items. *Stamping: Put paint on a sheet of paper. Dip cookie cutters in the paint and "stamp" it onto another sheet of paper. *Size: Which heart is largest? Which is smallest? *Sensory: Add cookie cutters to a sensory tub filled with heart shaped items. *Play Dough: Add cookie cutters to a play dough tub. Please see this post HERE for 20 activities to do with candy hearts! Well there you go! Over 35 activities that you can do with only $6 at the Dollar Store!